Right-click on the image and select “Save link as…” or “Save target as…” to download the document. “Success is never final. Failure is never fatal. It is courage that counts.” I believe those words exemplify the brand of courage that Boholanos have displayed over the past year, which was a year of immense challenges. Bohol faced unexpected challenges – for one, the 7.2-magnitude earthquake that shook the entire province. It was closely followed by Super Typhoon Yolanda, which caused a slowdown in our local economy because of the power shortage. It is indicative of the Boholano spirit that our disaster response was cited by many observers, including our top-level national officials, for resiliency and preparedness. Let me take the opportunity to thank our international partners from the United Nations humanitarian and other international organizations, national government agencies, the private sector, and volunteers who helped Bohol rise up from the rubbles. We are also particularly grateful for our strong partnership with Official Development Assistance agencies whose programs have seen us through our most trying times ever. 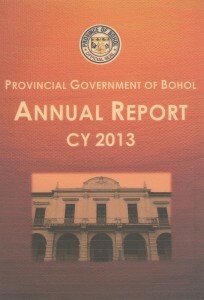 The Annual Report for CY 2013 presents our major accomplishments under the HEAT-IT Bohol Development Agenda, which include Health and Sanitation, Education and Technology, Agriculture and Food Security, Tourism and Livelihood, and Information Technology. It also includes the Post-Great Bohol Earthquake Rehabilitation Plan that has generated commitment from no less than President Benigno S. Aquino III. A great percentage of our efforts in the last quarter of the past year were devoted to addressing the impact of the earthquake. This does not mean that we have deviated from our development agenda. 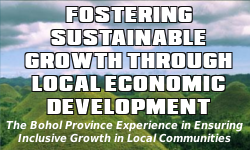 On the contrary, we are pursuing our “HEAT-IT Bohol HELPS LIFE towards the BIG LEAP” development framework with renewed vigor, especially in the light of recent developments that have encouraged us and enlivened our spirits even more. We are, of course, reaffirming our call of Padayon Bol-anon, which is both an advocacy and a command. When a runner stumbles, the crowd cheers, “Padayon! Padayon!” (or “Move on!”). The earthquake, Yolanda, and other challenges took us through our darkest times, but they also brought out the best in us as a people, and showed the rest of the world the strength and character of the Boholanos.